Are you looking for how to hang string lights in backyard without trees? We’ve done a few of projects with lights and no trees. We’ll show you three ways we did it and then cover a few other ways you can hang them as well. The first way you can hang them is by adding posts where you want the lights to go. In our case, we had a deck coming off the sliding glass door from the house. We knew we could use the house to hang part of the lights. 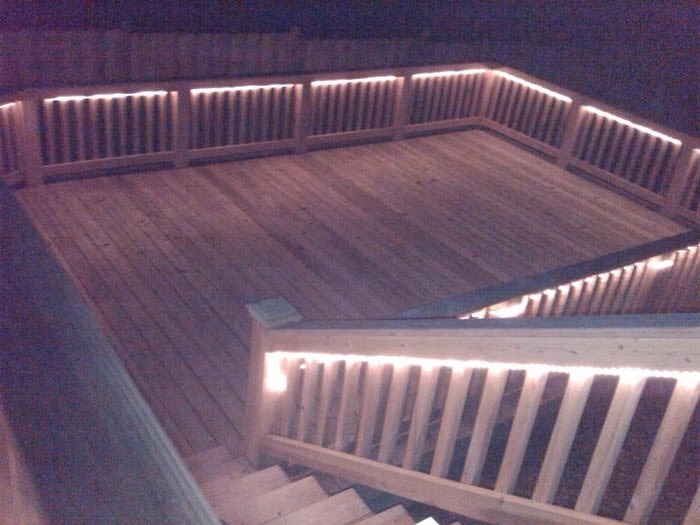 We just needed two posts at the end of the deck to light the decking area. Figure out if you’re using your house for part of this or if you need to string the lights using only the posts. If the house isn’t involved, then you’ll need 3, 4, or more posts to make the area that you’re stringing lights in. 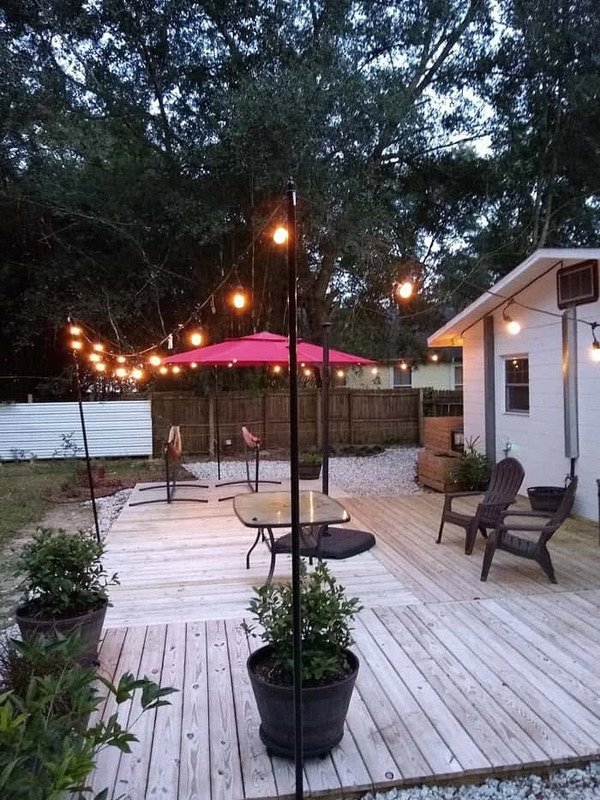 You’ll want to figure out where you want the posts to go so it will look right and mostly line up around the area where you’re hanging the lights. 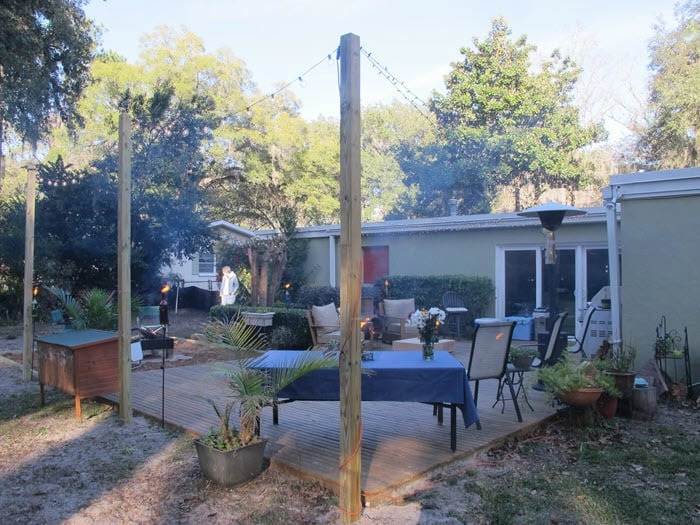 We used the house, but we were also covering a large area, so we used 3 4×4 posts. With the post hole diggers or the shovel start digging the hole for the first post. 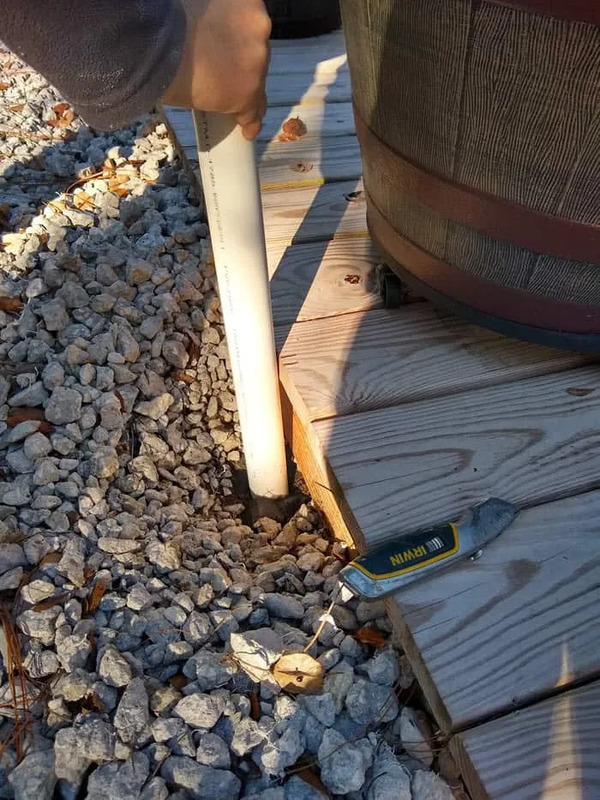 Since you’ll need about 3 feet to go in the ground, we got the 16 foot pressure treated posts. Now do the same with the other holes. Give it a good distance from the first one and make sure it makes like a square or rectangle area for the lights. Once the posts are in, you can use your ladder to go to the best area at the top of the post to screw in the C hooks. Now you can start running your lights. Actually, you want to test your lights first. We assumed they’d work and found out after running them, that one part was burnt out. Next, you want to plan how to run the lights so you can have an electrical outlet where you need it. If you don’t have an outlet easily positioned, you can run an outdoor rated extension cord. If you’re using your house to hold part of the stringed lights, then you’ll want to get light clips to hold them in place. You usually see them around the holidays. When you’re stringing the lights, wrap the wire around the hooks a couple of times for a little added strength. If you have outdoor rated lights, they sometimes also have little holes in the line to make this easier. If you aren’t attaching them to the house, then you’ll want to figure out the size and shape you want for the lighted area. Then, you can put the 4x4s in the best spot. The next method is similar, but uses metal poles so it’s not as intrusive. Along with the written instructions, we put together a quick video as well. You can cut the PVC down to 2 foot lengths and angle one side. The angle makes it easier when hitting it into the ground. After hitting it into the ground some, you’ll have to pull it out to remove some of the dirt. You can easily do this by holding your hand over the PVC top to create a suction. The dirt will stay in the pipe while you pull it out and remove the dirt from the pipe. Do this a couple of times to get the pipe as deep as you want it to go. 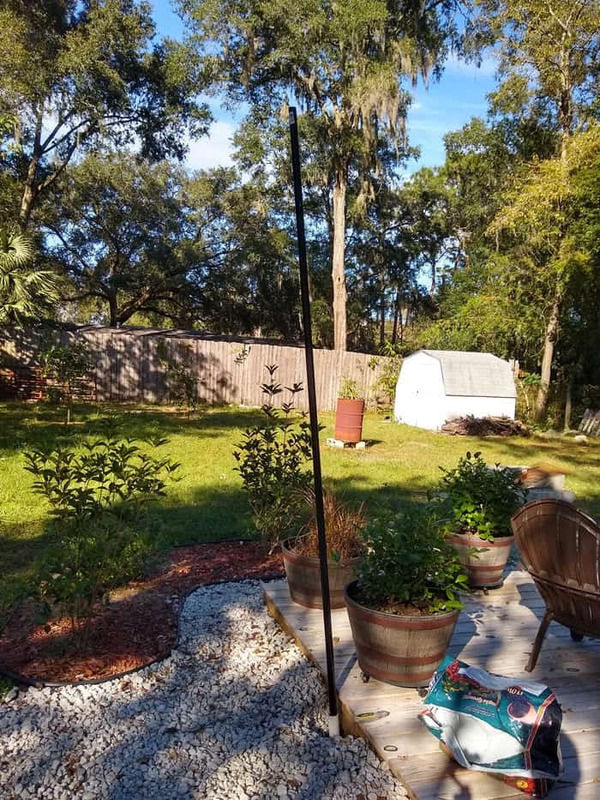 Now you can put the pole into the PVC pipe and it’s ready for the next step. 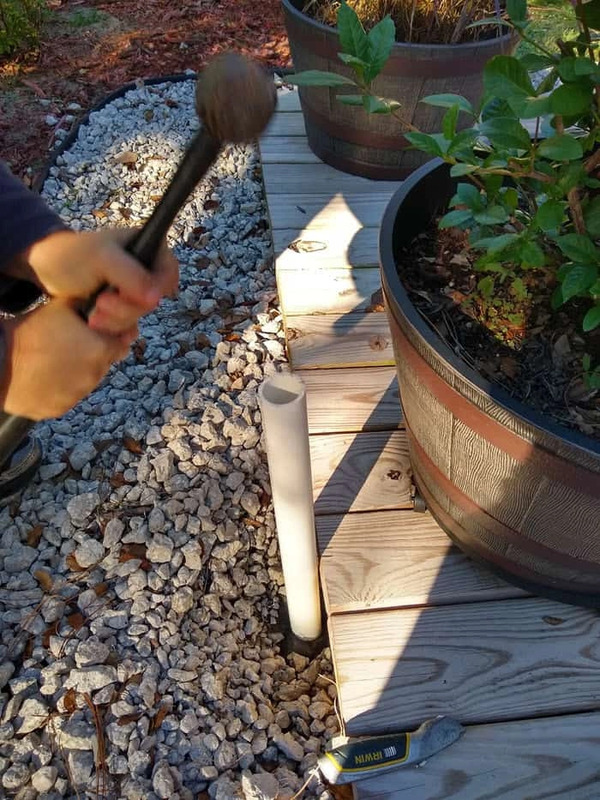 Note: Putting PVC pipe into the ground works great whether you have a deck or not. We have a ground level deck, so we pounded the PVC below the deck level to “hide” it. 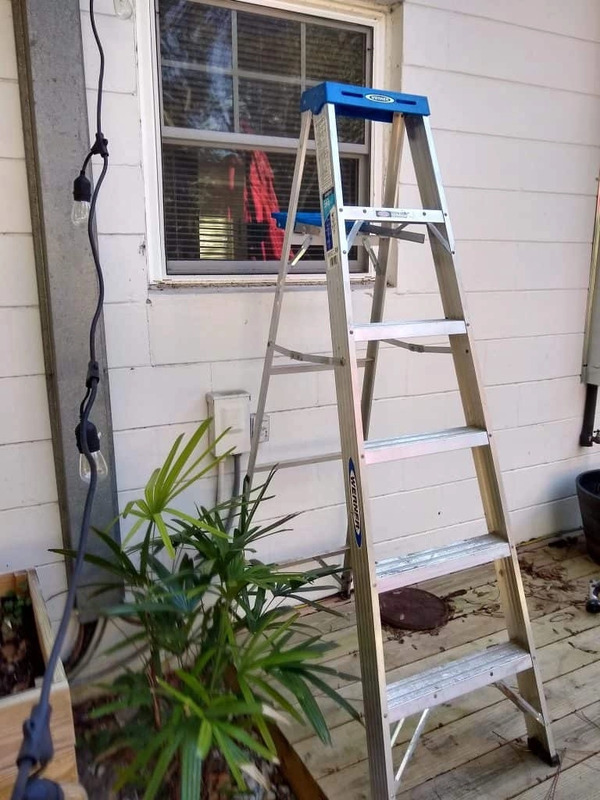 But, if you have a taller deck, you can add C clamps to hold the PVC pipe against your deck and then put the pole in that way. 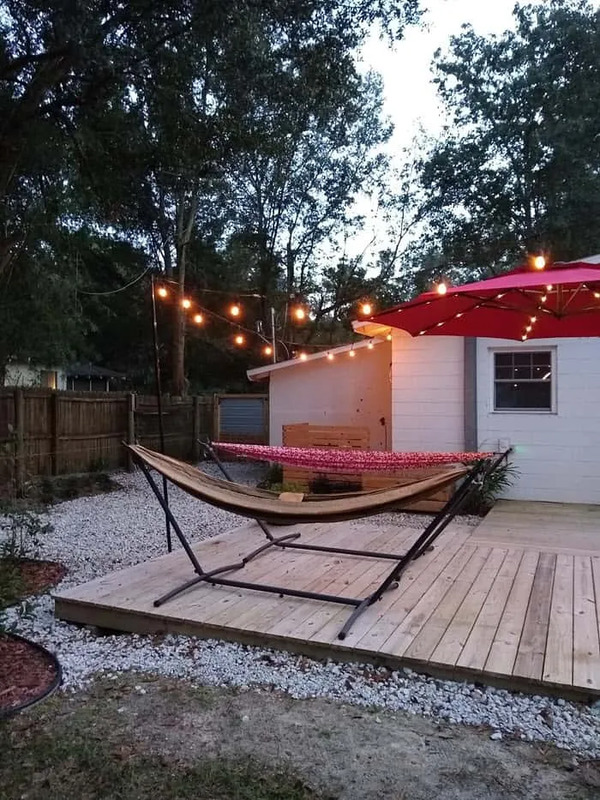 We chose to put up three poles for the size of our deck area that we wanted to cover. The average length between all poles is about 13-15 feet. Once we had all the poles in, it was time to string the lights. Again, check that the lights work before hanging them. And make sure that you start with the right end that will get plugged into your outlet or you’ll have to redo it. 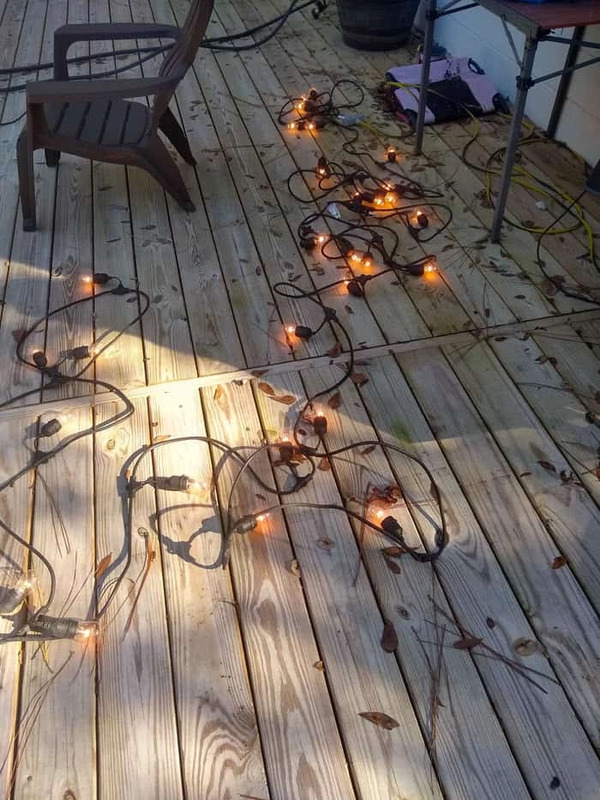 We laid out the lights around the deck before hanging them to make sure we had enough lights for the project. 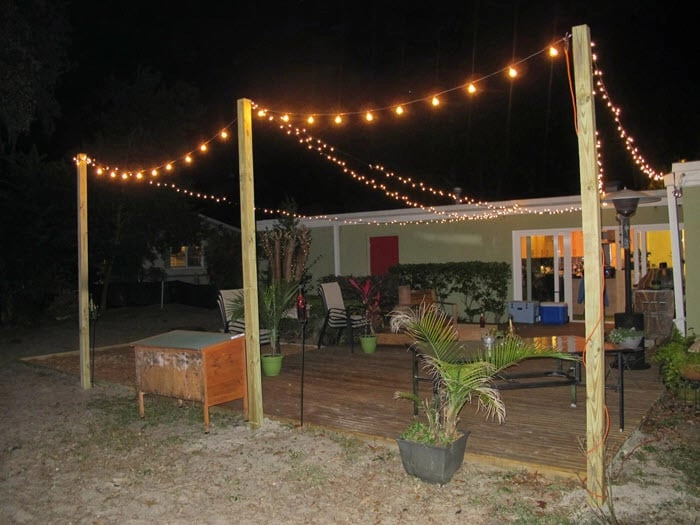 We used the house for the light ends so we started at one end of the deck and hung the light end to the house. Then we used a ladder to put the end cap on the pole and added an S hook in the hole and added the lights to the S hook. You can play with the slack in the lights and adjust to your desired height. Once you run the lights to all the poles that you have, we finished it at the house and did pretty good with the lengths. We’ll probably add one more string of lights to go along the house exterior. 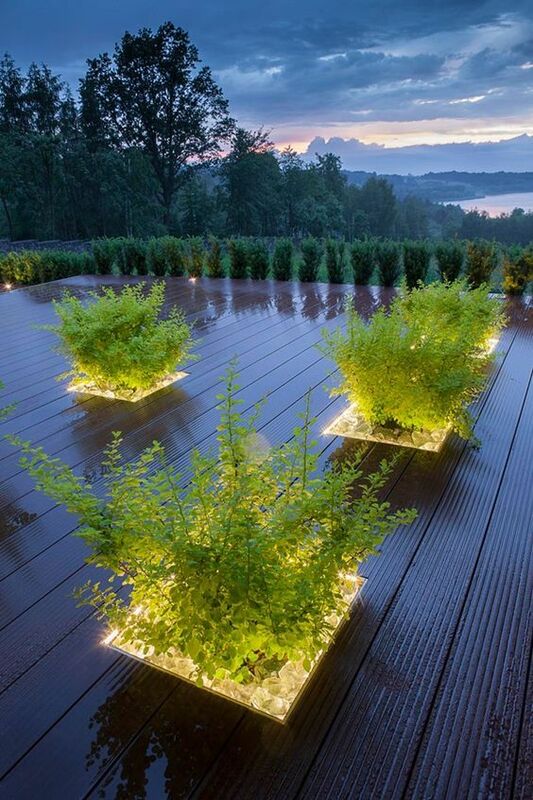 We like how this does a great job of outlining the deck and will make for beautiful lighting during our evening visits out there. There are so many ways to get the lights up and we only showed two little ways we’ve done it. Here, I’ll share some other ways you could get your lights up by this evening. Put lights along your fence. 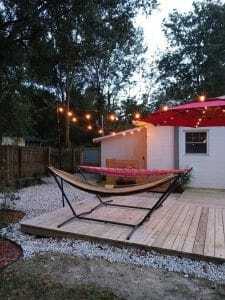 This adds so much depth and intimacy to your backyard. 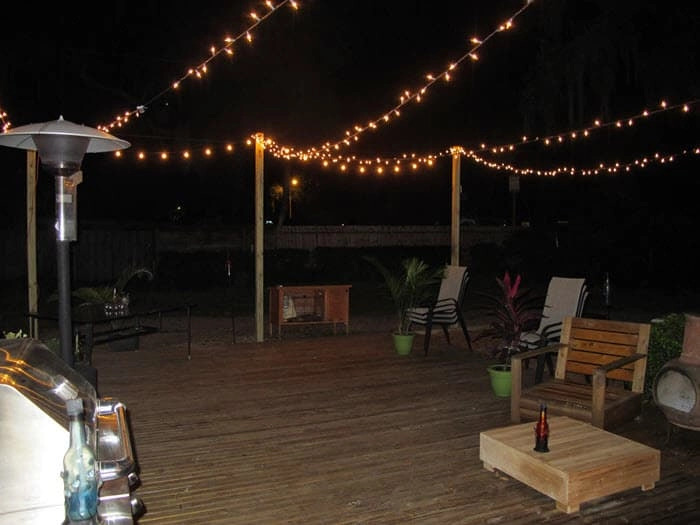 This was our last house and we loved the lighting around the deck. It was several levels so we just got some rope lighting that comes with mounting clips and were able to get this setup in one quick afternoon. 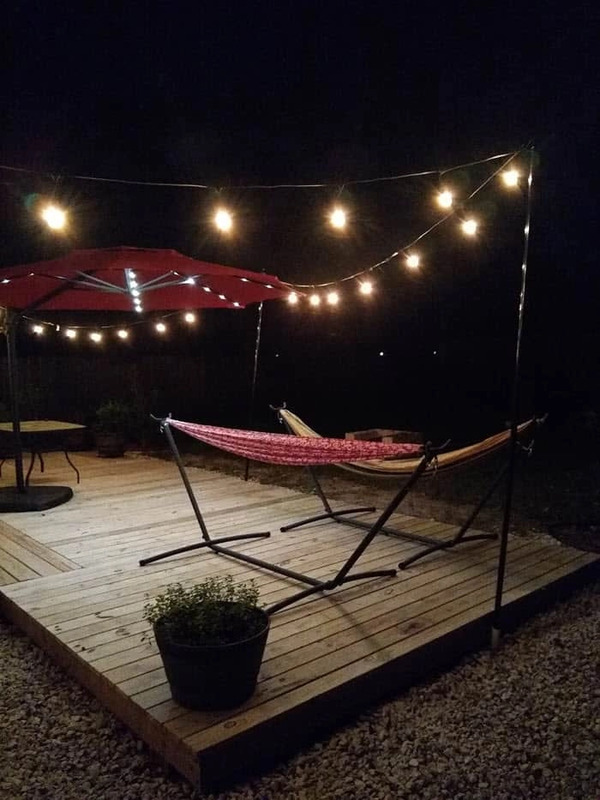 If you don’t have a gazebo, but you have an umbrella, you can add a nice string of lights to it. Then you can keep the umbrella open at night to showcase the lighting. We really debated on using our planters on the deck for the lighting. We decided against it just because we like the lights to be much higher. We also didn’t want to put that much weight on the planters. But usually you put concrete in the bottom of the planters and then add the soil and the plants on top of that so it would probably be sturdy enough for you. DIY your photo charms, 100% compatible with Pandora bracelets. Make your gifts special. 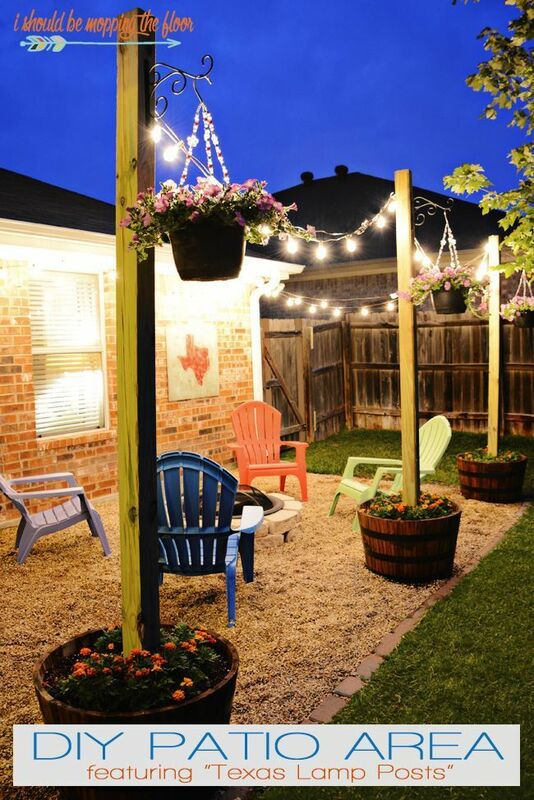 DIY Patio Area with Texas Lamp Posts | Add a patio with fun planter posts to a backyard area.